One down, eleven more to go. Well, my first monthly Ring meeting as your new president is now history, and I have eleven more times to get to do it again. Am I excited? You bet! In fact, I’ve already put together a full list of fun and exciting activities, talks/presentations, learning opportunities, games, performances, etc. for upcoming Ring meetings… and I’m a bit concerned about having enough time and space to get it all in! Speaking of space, if you attended either of our first two Ring meetings at our new meeting location (Hampton Inn), you’ve probably noticed that space is a bit of a premium commodity. Although we are saving about 60% on our monthly meeting room cost (which is great! ), we are dealing with less space. Is that a bad thing? Not necessarily! 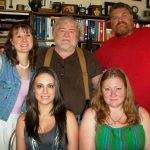 Years ago when we had England’s Bob Read at one of our WORKSHOPs, I had Bob do a late night show for the registrants. Bob was a hysterically-talented entertainer, and he taught me one very important thing. When preparing for his show at the WORKSHOP, he insisted that he do it in a meeting room that was small… quite small, in fact. He wanted the audience members nearly shoulder-to-shoulder in their seats, and a bit of a “standing room only” feel to the set-up. He explained that this is the secret of creating energy within an audience. “Cram them all together and they’ll respond better, laugh louder, and keep the energy levels high,” he explained. When I saw the way the group responded to Bob’s show that night, he was exactly right! From that day forward, when I do a show for a group in a community room, hotel banquet room, or any place where tables and/or chairs are set up, I insist that they’re set up as close to each other as possible… and the first row is as close to the stage area as possible. An audience that is spread out all over the room leaves lots of empty spaces… and these empty spaces become a vacuum for audience energy. Trust me, it’s true! So, back to our monthly meetings… the fact that we’re in a smaller room is GREAT for energy and performances, but we could soon outgrow the space. We are currently committed to the Hampton Inn through our June meeting. We love the staff at the Hampton Inn, and according to the recent survey, 53% of the respondents who have attended a meeting at our new location are either Satisfied or Very Satisfied with the venue. Only 21% of the respondents indicated they were either Unsatisfied or Very Unsatisfied. The board is already looking at options as we are anticipating continued increased meeting attendance over the coming months. It’s a very excit-ing problem to have! Thank you to everyone who completed the emailed survey last week! You provided some very valuable information and feedback to the board, and last week during the board meeting, we went through each response and category score and discussed at length. Your feedback has given us the tools to make Ring 129 even better… and I promise you’ll soon see some changes as a result of the survey. Without question, the survey indicated that you want to SEE more magic and LEARN more magic at our meetings. So, come prepared to do both! Before I close out this month’s column, I want to ask a favor of each of you. According to the recent survey, one of the most common “suggestions for meeting improvement” comments was concerning the amount of talking at the back of the room during the meeting. We received numerous requests that we somehow try to eliminate the conversations and talking going on during the meeting, presentations and performances. I understand that some people don’t realize that their voices can “carry” throughout the entire room and cause a distraction, but let’s all try to be respectful to our presenters and performers by refraining from talking to each other or the dealers while the meeting is going on. If you simply MUST carry on a conversation during the meeting, please take it out to the hotel lobby. Thank you so much for your cooperation! I hope to see you all at the March Ring meeting. In addition to the quarterly competitions, I have some fun things planned. Join us, won’t you? 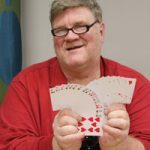 On January 25th, Laird Wilcox, the writer of our monthly column, “The Card Corner” passed away at his home in Kansas City. Laird was actually known by his family as Anthony or “Tony”. You see, Laird was the fourth of five “Laird” Wilcox’s! 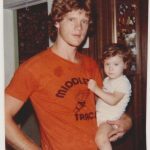 In an interview with Laird’s father, now living in Olathe, Kansas, I was able to piece together some interesting facts about Laird. Though we mostly knew him through his involvement with the local I.B.M and S.A.M. magic clubs, Laird had several other interests and hobbies. Laird was a trained Army Combat Medic Paratrooper. He spent two years in Germany and worked in several army hospitals during his military career. Following his term in the army, he worked as a nurse at various veteran hospitals including the VA Hospital in Kansas City. During his life he was an avid outdoorsman. He loved to hunt, fish and camp. He also grew up with and loved guns and weapons and was an active member of the National Rifle Association. He was in line to be one of the official local representatives of the NRA. Laird spent time traveling throughout Europe and became a very good amateur photographer. going through some serious physical issues which were only known to a handful of people. Laird willed most all of his magic to fellow ring member, Shawn Rivera. 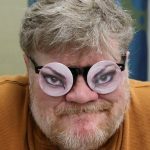 Laird Anthony Wilcox, 55, passed away at the age of 55 on 25 January 2018 in Kansas City, MO. 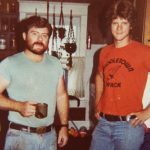 He leaves two sons, Laird J. Wilcox, 21, and Theodore A. Wilcox, 19, of Tulsa, OK; his father, Laird M. Wilcox of Olathe, KS; his mother, Eileen Maddocks, of Burlington, VT; two sisters, Elizabeth Carrier of Middletown, CT; Carrie Wilcox of Dry Ridge, KY; a niece, Christine Franklin of East Hartford, CT, and a large extended family. He was interred at Leavenworth National Cemetery. Laird “Tony” Wilcox was born in Topeka, KS on 18 November 1962. He lived with his parents in Lawrence, KS, until 1966 when he moved with his mother and sister to Clinton, IA, and then to Houston, TX in 1967. From there they moved to Middletown, CT in 1979 where he graduated from high school. While in Middletown he accompanied his mother who was a tour leader on two trips to Egypt to visit the Pyramids at Giza in 1982 and 1983. In 1983 he joined the U.S. Army where following basic training at Ft. Hood, TX, after which he took training as a qualified combat medic paratrooper at Fort Jackson, SC, and was assigned to the 1st Cavalry Division in Fulda, Germany on the East German border. He traveled widely when on leave in Europe, spending time in Germany, France, the Netherlands, England, Belgium, Spain, Italy and Greece. He was an accomplished photographer and had photos of his travels published in a number of collections. He returned to the United States in 1987 and was stationed at Ft. Riley, KS where he was assigned to Irwin Army Hospital, promoted to the rank of Sergeant and was subsequently assigned to the last remaining MASH unit held in reserve during Desert Storm in Iraq, ready to ship out at a moment’s notice. He left the Army after 8 years of service in 1991 and moved to Skaneatles, NY, where he went to work for the Veteran’s Administration Hospital and remained for a year before transferring to the VA Hospital in Kansas City, MO in 1992. In 1995 he married Ruth Ann Mason, daughter of Theodore and Ruth Mason of Tulsa, OK. They had two boys mentioned above. After their second son was born in 1998 Ruth Ann left for Tulsa, OK, to be near her parents and Tony moved to Olathe, KS, where he lived until he moved to Kansas City, MO in 2004. He stayed at the VA Hospital for 12 years and then moved into private nursing until he retired in 2012. Laird Anthony Wilcox was a member of Sons of the American Revolution, a hereditary organization of descendants of Revolutionary War veterans, and the Military Order of the Loyal Legion, a hereditary organization of descendants of Civil War Union Army officers. He was a member of Disabled American Veterans, AMVETS and an Endowment Member of the National Rifle Association. 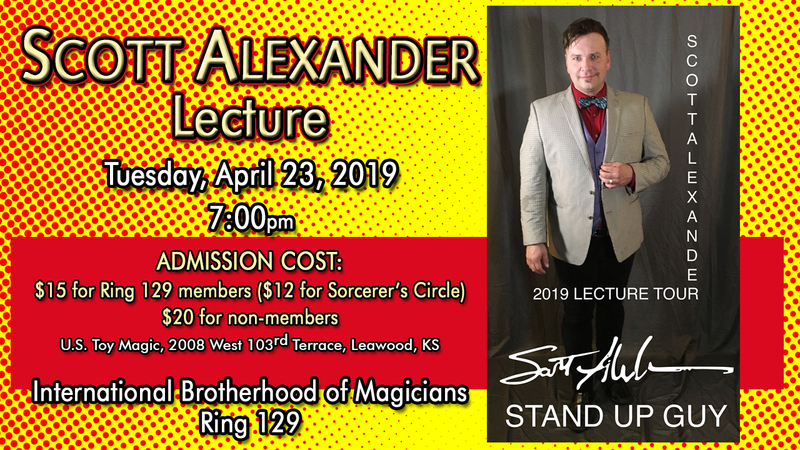 He was an accomplished amateur magician and was active in both the International Brotherhood of Magicians (IBM) and the Society of American Magicians (SAM). He performed for veterans at the VA Hospital and in the early 2000’s could be seen performing on the Country Club Plaza and other locations in Kansas City. 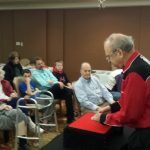 He was a regular attendant at conventions of both organizations and was well-regarded in both groups and good friends with a number of performing magicians. He will be deeply missed by his many friends and family members.